Personalized Letter Opener gleams in your choice of antique rose in electroplated pewter, 24k goldplate or silverplate over brass. We'll engrave a name on the handle! Measures 7 3/4" L. Specify name, up to 20 letters/spaces. Distinguished gift! Bought this as a birthday gift. I really wished it came with a gift box. But I must say, it is very nice, and I'm sure she will love it! Bought it for my daughter to use at work. she loved it. Making it personal is a great touch. The letter opener looks exactly like the picture in the catalog. It is a durable product and does not feel flimsy in any way. I am extremely pleased. 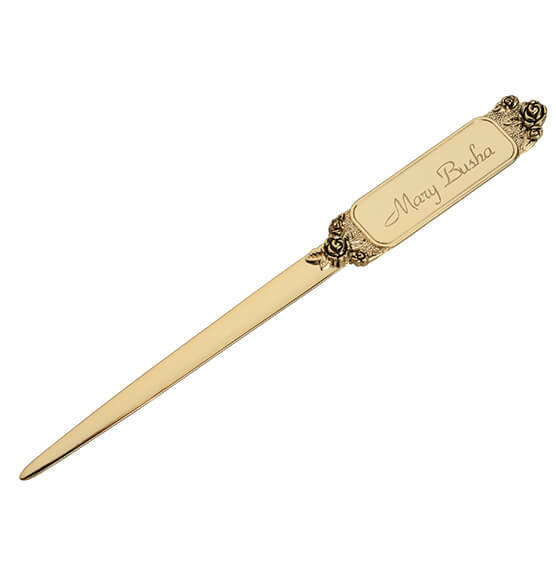 I bought several of these letter openers as Christmas gifts, having each of them inscribed with a different friend's name. They are beautiful and feel substantial (not at all flimsy) in the hand. The service from Walter Drake was FAST and impeccable! Easy to open your mail with. beautiful my ruth loved it! I intend to use the letter openers as gifts. I am sure that my friends will like them. The engraving is beautifully done. So Elegant! I will buy more for gifts. I did not know what to get my friend who had everything! I saw this and took a chance. It was the perfect choice, It is so elegant with the name engraved. I will be buying more for Christmas gifts. I highly recommend it. This is a beautiful gift that is personalized for the receiver to cherish for a very long time. This letter opener opens envelopes without rips. It also is useful in opening package. No more ripped fingernails thanks to this product. I recomend this product to everyone. Worth every penny. It display's my name beautifully. Also, it function's well at opening letters. nice because it can be engraved with a name. I plan to buy more for gifts. I got so tired of cutting my fingers opening envelopes; so, when I saw this on Walter Drake's site, I had to order it. Plus, being personalized makes it so much more beautiful. Fine addition to my office. Thank you! I ordered several of these letter openers. When they arrived I opened the package immediately because I wondered how they really looked compared to the picture. The openers were gorgeous, so rich looking, and the name were written on each item so neatly. They will be great Christmas presents. This was absolutely beautiful. I got the kitty one with personalization on the back. The engraved script is beautiful and done very nicely. This opener is a good weight and not at all flimsy. It is sharp enough to easily open a letter yet not overly sharp. I am very happy with my purchase and I would recommend this to anyone who is contemplating buying one. At first I did think it was a bit pricey but now I think it is a good price for the beautiful engraved personalization and the overall quality of the item. This would make an excellent stocking stuffer gift or main gift for someone. Great buy I'm glad I bought it. You wont be sorry if you purchase this. Style, easy to use . They should have some kind of case with a snap clip so little kids don't go poking someone with it. I will use this at home and I like the Style, it should come with a case so kids don't go poking someone with it. This is a very sturdy piece of work....the only thing that I found disappointing is that the engraving was not deep enough...you have to hold it under a light to see it. I use it at home only, and whats nice about it is the Style but it should have a case so kids don't go poking someone with it. Style, easy to use but needs case so kids don't go poking someone with it. Overall nice product except that I had it monogramed with initials. There is a capital S in the initials but it looks more like an L on the inscription. Walter Drake was very nice about it and redid the product for me -- spacing out the initials this time but it still doesn't look right. If I did not know it was an S I would not recognize the name of the business. Poor quality. Poor material. Bends too easily. In fact, it came bent in a 180 degree arc. Waste of money! This letter opener is the prettiest I’ve seen and I like the personalization feature.